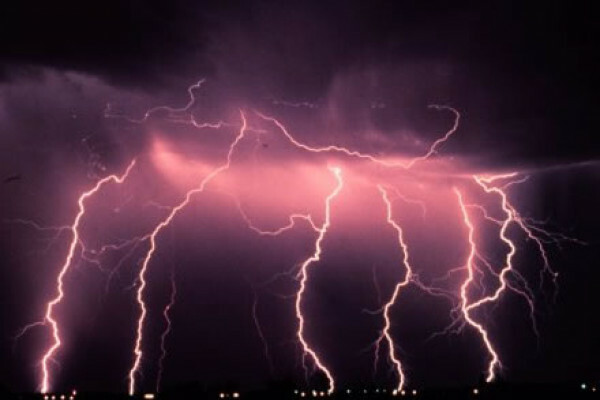 Robin Hogan, a professor of atmospheric physics at the University of Reading, is working with the Met Office on a project to develop a statistical database of storms. It's called DYMECS - Dynamical and Microphysical Evolution of Convective Storms - and involves real-time analysis with the aim of helping to improve storm predictions in the future. Robin - What we do is we use the Met office radar network and that takes images of the rainfall over the whole of the UK every 5 minutes. And from that, we can see with incredible detail what the surface rain rate is and we can see how we can track one storm from one 5-minute period to the next and workout where it's going and so typically, a storm will last for maybe an hour or sometimes 2 hours and so, we're able to see how that storm evolves and particularly how surface rain rates get larger as the s torm gets bigger, and then as it sort of breaks up later on in its life, it will then decay away. And we can use computer algorithms to follow that storm through its evolution. Sue - So, it's relatively easy to follow. How easy is it to simulate? Robin - That's one of the biggest problems of predicting floods in the summer. A model of weather forecasting has to capture lots of different processes to get convective thunderstorms correct. It needs to represent things like hail stones, it needs to capture the updraughts correctly - that's the vertical winds that are carrying the particles up inside the cloud - and you often get combinations of super cooled water droplets, so this is droplets that are below zero degrees but they're still liquid and they will freeze at some point and the models have to capture the time at which that occurs and all of these processes are important for working out the surface rain rate which is what we want to get for flood forecasting, in particular. Sue - So what is this project aiming to do then? Robin - What we want to do is to use the capabilities of the Chilbolton research radar to capture the evolution of thunderstorms in much more detail than we've ever got before and that will then be combined with a modelling component, which will be using the Met Office's model, which has quite phenomenal resolution of the whole of the UK - it has a 1.5 kilometre grid box size - and by combining the observations and the modelling we're able to then see in which aspects the model isn't doing very well to hopefully improve it. Sue - Why does it need improving? You say one and a half kilometres. That must cover even the smallest of villages. Robin - Well even though it's 1.5 kilometres, models are only as good as the data that go into them and so it's relying on weather balloons that are only launched every 12 hours, for example, and the other thing is that the processes still have to be very much approximated. So, in particular, at 1.5 kilometres you are still having to represent the fact that as a convective storm - so a thunderstorm - rises through the atmosphere for example it will have to represent a mixing of air between the cloudy air and the clear sky next to it at just the right rate in order that the right amount of water gets up to the top of the troposphere, and if you don't get that right then the cloud will not go too high or it will go far too high and you will get the wrong amount of rainfall coming out of it. Sue - So how do you improve then your measurements, your data, if you're only as good as the data you put in? How do you get better data? Robin - The Chilbolton radar is really where we're coming from. So currently, when we see a weather forecast on the TV we see measurements by a number of radars around the UK that have a one degree beam width so their resolution at a distance of 60 kilometres is something like one kilometre. Now what the Chilbolton radar can offer is the ability to scan the three-dimensional structure, so not just the surface but also up to a height of around 10 kilometres which is typically how high storms get. This radar has a quarter of a degree beam width, so that means that at 50 or 60 kilometres distance it can see clouds with a resolution of 250 metres, so a much higher resolution. And the Chilbolton radar as well as being able to measure the intensity of rainfall is also able to measure the wind speed and so it can really see the flows of air that are acting to develop and build the storm. Sue - Now you've been analysing various storms. Robin - That's right. We have had something like eight very good days. Sue - In your terms a good day then is a storm. Robin - Absolutely! The more storms the better as far as we're concerned. We are hoping to get a total of 40 days over an 18-month period. We're actually interested in convective clouds in winter and summer so the Met Office also has a problem with snow showers, in particular, coming from the east so we're happy to study those when they come along and I'm sure we will be able to say some interesting things about the performance of the model there. So, we are hoping that flood forecasts can be made more skilful which is certainly of great economic benefit for the UK. Next Mapping a Mushroom Trip, Speedy genes and Magnetic Soap!